Computer Science is fun. cs4fn's aim is to share our passion about all things to do with Computer Science and especially to show that it is an exciting subject that is great to learn about just for the fun of it. 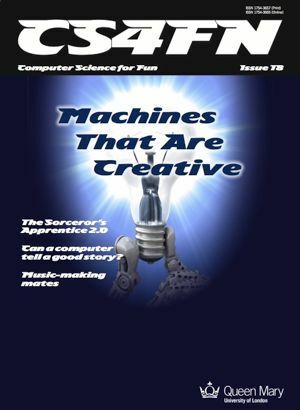 We produce a free magazine twice a year as well as a series of special booklets (for example we have produced three magic books on magic tricks and the computer science behind them). We have also produced magazines on Electronic Engineering and Audio Engineering and their links with computing. All are sent free to schools in the UK (over 20,000 copies per issue). We write lots more articles that go on the website. There are now well over 1000 articles on all kinds of fun topics. Online pdfs of our fun magazines and booklets have been downloaded hundreds of thousands of times from people in over 80 countries. We are a partner to the BBC's Make it Digital campaign. We hope you will enjoy exploring cs4fn as much as we enjoy writing it. cs4fn also has a sister website specifically to support teachers: Teaching London Computing. There we provide activity sheets and other resources to help teachers both teach the Computing curriculum and go beyond it. We also give free workshops on fun, unplugged ways to teach computing and computational thinking, as well as providing CPD courses for teachers. Originally the focus was on providing support in London (hence the name) but we now provide resources across the UK and internationally. Over 14,000 of our resources for teachers were downloaded in our first year. UK schools can request free copies of the magazine can be requested via our teachers area. cs4fn was created in 2005 by Paul Curzon and Peter McOwan of the School of Electronic Engineering and Computer Science of Queen Mary University of London. Since then we have been helped by many people locally, most notably Gabriella Kazai, Jonathan Black, Chrystie Myketiak, Jo Brodie and Nicola Plant. Many people, institutions and companies support cs4fn. In addition to Queen Mary University of London, we have received major financial support from EPSRC, The Department for Education, the Mayor of London and Google through their CS4HS programme. We are a Friend of Computing at School. In addition to staff at Queen Mary University of London, members of many other Universities have supported cs4fn by writing occasional articles or contributing stories or images from their research. We have also worked closely with several major research and public engagement projects. The look and feel and layout of the magazines is the work of Queen Mary University of London's central college publications and web department (who we think are brilliant). If you have any comments about the site, good or bad please let us know using the contact form (see the link from the sidebar on the left). We will strive to fix problems as fast as we can. If you would like to submit your own articles or other material for the site, please also use our contact form to get in touch. We would love to hear from you. Details of rules about use of contributions, copyright etc for submissions can be found on our Copyright and Contributions page.